What are SAP’s responsibilities and what are yours when using SAP Cloud Platform? What things do you need to bare in mind before you get started? What about governance? Do you need additional teams? What are their responsibilities? Once you have the teams in place, how should you set up your account model? What are some real life examples that have worked well in the past? What about security and compliance? And when all is set and done, how do you manage the lifecycle of your applications? What are the next steps? 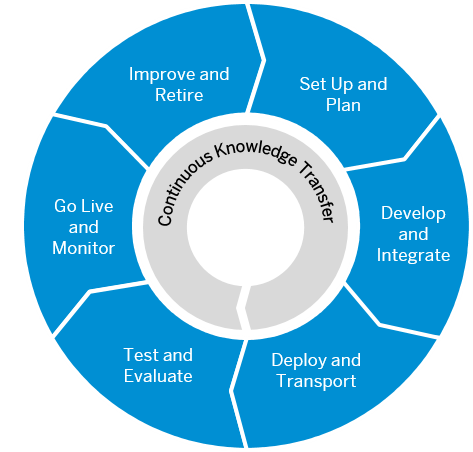 All these questions and more are now answered in the first consolidated set of recommendations and best practices for planning your landscape and managing the lifecycle of your applications on SAP Cloud Platform. The new Planning and Lifecycle-Management Guide helps you take the first step into the world of SAP Cloud Platform, offering you not just the bigger picture (and helping you make sense of all the documentation out there), but also examples of tried and tested models which were proven to work well. Whether you are an architect, development project lead, administrator or developer, completely new to SAP Cloud Platform or already familiar with it, there is something in this guide for you. Build teams, set up your account and security model and create an enrollment process for your development projects. Get an overview of the tools and programming languages that are available on SAP Cloud Platform, and how to use multi-target applications to efficiently manage dependencies. Deploy and transport simple and multi-target applications. Test and integrate your application with other solutions. Learn what’s important for a Go Live and how to monitor applications, services and hybrid landscapes. Improve your application, perform housekeeping and learn about what’s important to consider when you want to retire it. 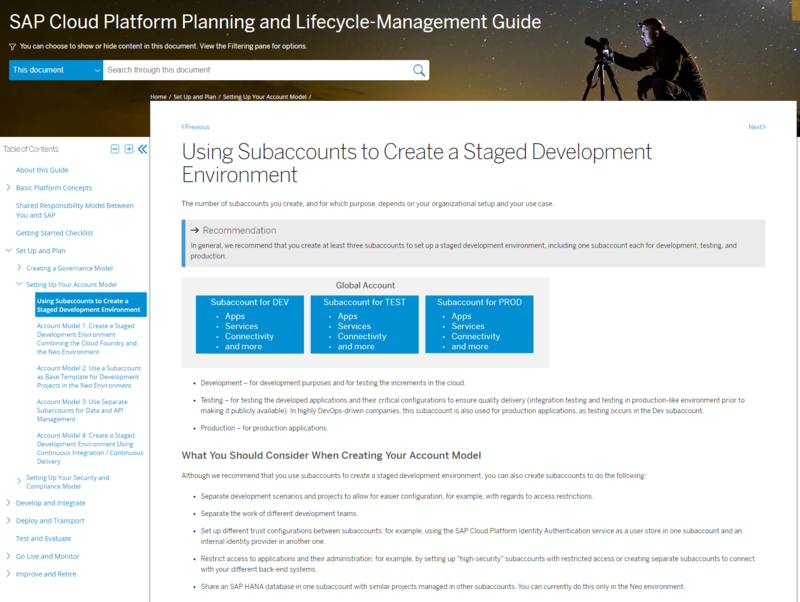 The Planning and Lifecycle-Management Guide walks you through 4 of the most common scenarios and provides tried and tested solutions for setting up your account models. It lays out both the benefits and the limitations of each approach and helps you identify the setup that best fits your needs. We know that such a guide has been long requested and our goal is to make it as relevant and as useful as possible. As a result, this is only the beginning, and you can be sure that this first version will not be the last. We are working on constantly adding information and improving this document, so if you have any feedback or suggestions we would highly appreciate your input! Write a comment below or get in touch – we look forward to hearing your thoughts! great to see this guide. My first request would be that you enable the commenting function directly in the documentation like it is done in the SAP Innovation Management: Master Guide. Check my comment on the right. happy to know you find this guide useful! I have now enabled the commenting function for all SAP customers and partners, which should hopefully make providing feedback easier.